Last summer I made brownies with fresh blueberries from Blue Honey Farm and they were really good! Dark, fudgey brownies with the occasional bite of blueberry! 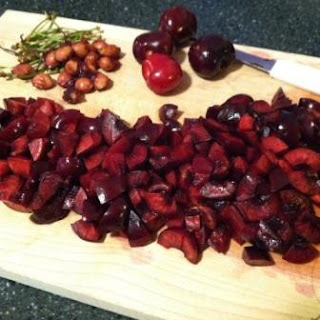 Recently I made the same recipe with fresh cherries but raspberries would be just as tasty! Here is the recipe and a few photos. I have also converted this to a gluten free version but cannot find my notes! However when the gluten free version turns up I'll be sure to post it! Nothing special to this recipe at all, but I always do a little tweaking and in this one I cut the sugar back. You can substitute some of the butter with unsweetened applesauce, whole fat Greek yogurt or refined coconut oil (best to use one like Tropical Traditions as they do not use chemicals or bleach to refine theirs. Click HERE for a code to receive their cookbook FREE with your first order!) However in this particular recipe I wanted a moist fudgey brownie so I went all out with butter! (And absolutely NO substitutes! Quality tasting food requires whole food ingredients. Margarine, I Can't Believe It's Not Butter and those similar are NOT real nor do they taste good. Please, please, please do not use these. Not only are they full of synthetic ingredients they just taste bad!). Beat butter and sugar until fluffy. Add eggs (not necessary to do one at a time, all at once is okay for this recipe, the fresh berries taste amazing when not cooked beforehand). Gently mix and add vanilla. Set aside. In a separate bowl add cocoa, flour, salt and baking powder. Mix well with a fork or wire whisk. Gradually add to butter mixture until well blended. Gently fold berries of choice into batter. How much you use is up to you. For a thicker brownie put into an 8x8 greased glass baking dish, fill to a little over half of the dish. You can bake the extra batter in muffin cups. Bake at 350 degrees for 25 - 35 minutes. Time depends on your individual oven. 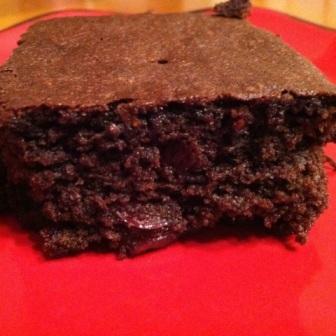 For thinner brownies use a larger pan and adjust baking time to less. Or you can turn all the batter into muffins. Tips on greasing a pan - when greasing a pan for baked goods please use butter or refined coconut oil. Do not substitute with sprays or vegetable shortening. Real butter will give you the best texture on the bottom and side of baked goods, especially brownies. Also only grease the bottom and corners of the dish. DO NOT grease to the middle or top. Anytime you bake something that rises (brownies, cakes, etc) the fat on the edges will not allow the batter to rise properly! This is a common mistake a lot of people make and then wonder why their final outcome isn't picture perfect. Trust me, just the bottom and corners, everything will come out of the pan just fine! So you find yourself with fresh cherries and no hand held pitter what do you do? I decided to prep mine as I do my avocados. After washing the fruit I removed the stems and the ran a small paring knife completely around the middle of the cherry. Took one side in each hand (using my thumb, pointer and middle fingers) and twisted the two sides apart. The seed will remain in one half and so use your finger to pop it out of the other half. Probably more time consuming than using a tool but I actually enjoyed it! There is something about slow cooking and baking that makes you appreciate the dish that much more! Thanks for this recipe and the cherry tips! I can't wait to try these! You are welcome Jessica! Thank you for reading. Have you had a chance to make these yet? Delicious with cherries but I prefer blueberries!